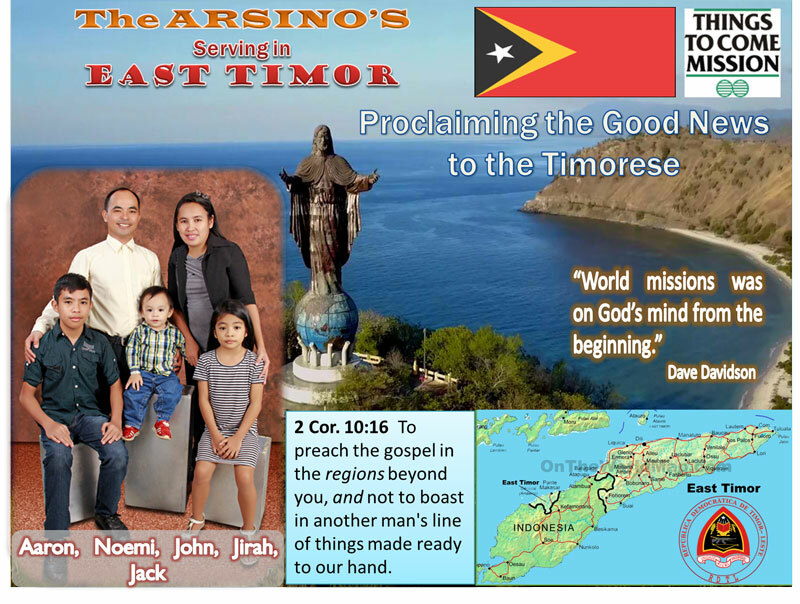 Follow the Arsinos as they pioneer a brand new TCM work in East Timor! Aaron and Noemi Arsino are eager to put their church ministry experience and GTCM missionary training to work on the mission field. In their home country, the Philippines, the Arsinos planted and established a Grace church in Bohol, and spent the last 11 years pastoring and teaching Sunday school at Grace Gospel Church of Christ in Surigao City. Aaron is a graduate of IGBI and holds certificates in computer science, English and teaching. Noemi has a Bachelor’s degree in Physical Therapy. Click in Newsletter in the right side-bar. When I was a missionary kid growing up in the Philippines, my family flew TCM’s small airplane through Indonesia to Australia and back. A lot of excitement on that three-month survey! One of the cities where we landed was Kupang on the island of Timor in Indonesia. I remember being really hot as my dad fixed a radio and then the long over-water flight to Darwin, Australia. That trip was the catalyst for missionary work started in those two countries. Now 48 years later TCM is preparing to send our first missionaries to proclaim God’s grace in Timor. This time the destination is the capital city of Dili in East Timor, a country which did not exist until 2002. That area was under Portuguese control until 1975 and then the Indonesian military occupied until 2002. The occupation was sometimes violent with over 200 Timorese being massacred at Santa Cruz cemetery on a single day in 1991. Monuments scattered throughout Dili tell the story of East Timor’s struggle for independence. The official name of East Timor is Timor-Leste because of Portuguese being the national language. The common language is Tetun, which borrows many words from Portuguese and Indonesian. Sadly, the Tetun Bible includes only the New Testament and Genesis—with printed copies difficult to find. This in itself is a major challenge for the missionaries of East Timor. The literacy rate at independence was 50% although that rate is rising. East Timor is a mountainous country—Mount Ramelau reaches nearly 10,000 feet—surrounded by beaches and coral reefs. Travel by road is slow and tiring. East Timor is also the most Catholic country in the world at over 90%. However, most people also believe in many spirits and gods attached to objects and places. Then God called the Arsino family. Aaron graduated from TCM’s International Grace Bible Institute in the Philippines and has served ever since as a pastor, church planter and supervising minister. He loves evangelism and church planting. During the past ten years his region has planted 16 Grace churches. The Arsinos completed their GTCM missionary training in 2017 and are on fire to take the gospel to East Timor. In March 2018 Aaron traveled with me around Indonesia for three weeks before doing a one-week survey in East Timor with missionaries Gomer and Nene Indino. We met many friendly people who were open to discussing spiritual matters. We also quickly found out that only a small minority of the population is conversant in either English or Portuguese. The Arsinos are already multilingual and are ready to add another language. We had a humorous lesson about the infrastructure when Aaron stepped into an open manhole one dark night while looking at the street map on his phone. Praise the Lord he was not injured, but we all learned to be careful after that! Aaron will go to East Timor this month to look for housing, language school, school for the children and to learn more about visa issues. Noemi and their three kids will follow within two months. The Arsinos will be supported as part of TEAM Timor. Support for them will go to the TEAM account and then be distributed to them. Our plan is to have a second missionary family with the Arsinos next year. Please see the enclosed brochure for the support needs of the Arsinos. Thank you for faithfully standing with TCM in taking the gospel to the regions beyond. God’s sure promise is that our labor for the Lord is not in vain! 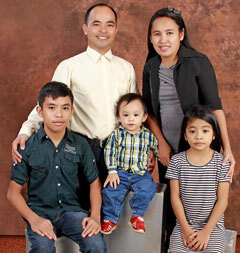 Aaron & Noemi Arsino were accepted as new TCM Team missionaries to pioneer a brand new TCM work in East Timor. 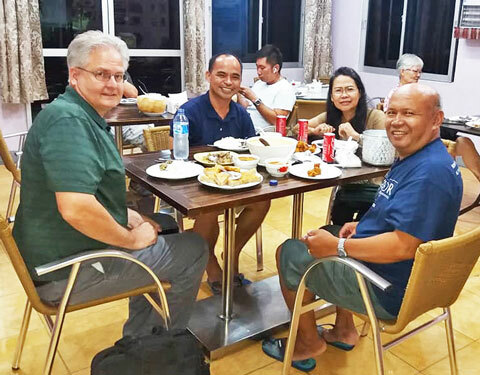 In March 2018 Aaron joined TCM International Director, Ben Anderson, and veteran Portuguese-speaking missionaries Gomer and Nene Indino, to survey East Timor. Survey trips gather information on the spiritual demographics of the country and receptivity of the people and government to gospel outreach, estimated expenses for a missionary living there, visa requirements, suitability for singles/couples/families from varying nationalities, and local contacts. Aaron plans to move to Dili, the capital of East Timor in May 2018 to follow up with contacts and find suitable housing for his family. Noemi and the children will follow within 3 months. Gomer and Nene Indino are praying about relocating from Brazil to join the Arsinos.